FAIL: Antarctic research station wind turbine crashes, diesel to the rescue | Watts Up With That? From the ABC Australia, video follows. Proof of something we’ve always said: You need a fossil fueled backup generator for any “green”wind/solar power project. An Australian Antarctic research station is now relying solely on diesel power generation after a wind turbine collapsed overnight. “We have no idea what the cause of it is yet,” he said. Dr Wooding said the turbine was one of two on the station, but both had been deactivated as a precaution while investigations continued. November 9, 2017 in Green tech. If they do not know why it fell off , what good is “deactivating” going to do? Does the wind exert less force on it when it is locked ? I doubt it , it probably has more wind resistance and more load on the support tower. Actually it is only held on by Nuts and Bolts. Likely the problem was that it was simply so cold that it froze it’s nuts off. Rest in pieces, Happy Feet. Indeed, a squadron of low flying goggled up, penguins. The BBC does something worthwhile. You feather the blades, so the wind resistance goes down a great deal. That penguins flying to the rainforest video is hysterical. I admit they had me going for about thirty seconds. PS…if you had to look it up to find out that video was an April Fool’s Day joke…you may be incredibly gullible. I mean like “Send me $10,000 and I will send you the winning lottery ticket you did not know you had bought” gullible. After looking again, I was credulous from 0:32 to 0:48 or so, but had my first doubt at about 0:40. By 0:48 I was laughing. Bryan clearly needs to hear the story of the “brass monkey”. Early sail powered gun ships needed to store the cannon balls near the cannons. They used a brass monkey. Cannon balls were placed on the brass monkey with the bottom layer retained by the brass monkey, the next layer in the pockets between, until the final cannon ball was safely retained at the top. Unfortunately, the coefficient of thermal expansion of brass is significantly different from the coefficient of thermal expansion of iron. The brass contracts significantly more in cold weather. In very cold weather, the brass monkey would contract to the point that the cannon balls would fly off the brass monkey and could seriously injure the sailors. It was clearly ” cold enough to freeze the balls off a brass monkey”. That video is a hoax. Everyone knows they fly south for the winter. Plus BBC used trained penguins. tearing the structure apart. Commercial turbines (and I assume this one) have brakes and above a certain turbine spin rate, stop the turbine blades. They may also rotate the turbine to present the smallest area to the wind as well, but I am not sure they also do that. When wind speeds become high and have the most energy, turbine wind fields stop producing power. Ironic, huh? But these were calm conditions, if I understand the report correctly. “The winds at Mawson are always quite strong at night, so they were up to about 40 knots’—that would be 46 mph. Older turbines, and some newer ones probably, cut out at 40 knots. I wouldn’t think the ones in Antarctica would cut out that soon, but you never know. You’re right on the stopping of turbines when the wind is high, but Bentz law says the energy going into the turbines levels off at 40 mph wind, or thereabouts. I can’t find my chart at the moment. People are usually unaware of this reality. They think more wind, more electricity. My guess is that either ice or bird guts unbalanced the blades and it shook itself apart. Could be the result of a deficient de-icing protocol and the problem had been building up for a while. My guess is metal fatigue. It is exhausting being metal in those conditions. It’s Betz law. From what I can see it refers to the fraction of the available energy that can collected drops with velocity increase. However the available kinetic energy is proportional to the square of the speed. Also the effectiveness of the turbine and generator increase with speed, so there is a net exponential gain in output as speed increases. The limitation is that the machine can destroy itself if it is uncontrolled. Makes sense co2isnotevil. Looking into the positive now. The European Commission NER300 project innovated a $2 billion windmill de-icing system in addition to straw energy. The latter can be forgotten in Antarctica, but the former has been tested in Sweden. It’s perhaps for sale cheap now, if for nothing else, for testing in even colder conditions. while operating this turbine saved on a lot of diesel. “shipping diesel to remote locations is expensive and takes a lot of effort…” effort that are all the same whether you transport 2 units of fuel or 3. So basically, no savings at all. This turbine was just an hassle for the greenwashing show-off. And now the show backfired, showing how unreliable it is. Fueled by what? If you’re concerned about shipping diesel, do the math for hydrogen in any form. PEM fuel cells consume ~15 standard liters per minute per Kilowatt of output. It is called the precautionary principle. We don’t know why it fell off, so it could again as we do not know what to fix. Next time it falls off someone may be under it. Safest is deactivate and use diesel which always works. Diesel is pretty reliable, but they do fail occasionally. Anything will have an MTBF. This gives rise to a grand old principle of engineering, viz. don’t put all your eggs in the same basket. Considering that without power in Antarctica in Winter, you are D E D dead, and further considering that resupply missions are typically impossible for several months in a row, I would think that at least triple redundancy would be the minimum required for any sort of illusion of safety. Unless they have a highly qualified diesel mechanic who is also a trained electrical repair specialist onsite at all times…plus a room full of spare parts. Cheaper I am sure to just have several wired up to automatic transfer switches. Bear in mind that November is not winter in Antarctica; it is late spring, with the longest day of the year coming in just over a month. I’m sure the windmill endured far harsher conditions about four months ago than it does now. I remember an oil engineer telling me that working in Alaska was extremely dangerous. He was working at a site over winter. There were 30 diesel gensets on site to get them through the winter. They were all operating – they couldn’t be started if it was too cold so they were all on operating standby. Over the winter gensets cutout one by one for some operational issue. If the situation got down to only five operating gensets then the crew really got worried until the warm period. If all gensets died then the crew would die with them. Potentially the issue at Mawson is that the Australian Government and CSIRO sends too many scientists to the base and not enough mechanics. It seems obvious that the wind machines couldn’t stand up to the ambient conditions of the environment and failed. Perhaps a nicely qualified mechanic would have sussed this out? Having spent a lot of time in the area of 1 – 5 degrees either side of the equator. I have witnessed a lot of equipment that has failed in that environment because designers and engineers didn’t take into consideration the prevailing harsh conditions. a went with solar………….oh right. Well, one deactivated itself. The other was “taken off-line”. I don’t know if off-line means stopping rotation or simply disconnecting electrical load. As to why it might have failed, anyone want to guess at maintenance (or lack thereof)? At least one of the two deactivated itself. Maybe they forgot physics 101. The power of the wind increases in proportion to the cube of its velocity. A gentle zephyr can quickly become a raging tornado. High on the failure mode list would be asymmetrical load causing vibrations which essentially shake the turbine apart. Zero rpm ➜ zero rotary forces. The blades rotate, I suspect when the unit is down, they rotate the blades into a neutral position, so that a direct hit of wind won’t cause as much force on the system. It could be frozen bolts, or some kind of shear event, or wind suddenly changing direction causing a snap. Feynman needs to come back and do O-ring tests on various parts of the windmills. And here we have a scene on video of an “advanced technology” which Don Quixote would feel right at home with. Anyone want to bet on the odds these guys figure out what happened ? I mean other than the fact that the turbine fell off its tower. Thirteen govt. agencies has stated a consensus assessment that it was probalby russian ( or NK ) hackerz. Failing that it is Iran not living up to the “spirit” of the deal to limit their nuclear development. More sanctions to be applied very soon. Very, very soon. Very bad. The Ozzies claim a substantial slice of the Antarctic. This claim is only recognized by a handful of other countries. China want’s to move down there in a big way. Maybe it was Chinese hackers – probably was a Chinese built wind machine. BTW. The Antarctic is one and half times the size of the Continent of Australia and one and half times the size of the lower 48. i.e. A continent and a very big land mass. There a really a handful of weather stations on the Antarctic continent. So any figures you see of climate conditions or the change thereof relating to Antarctic are fanciful at best. Oh great, now moderate wind conditions are destroying these things. Tacoma Narrows bridge failed in moderate winds (40 mph in fact!). Every engineering student has gasped at that film. I wouldn’t call 40 knot winds ‘moderate’, except in Antarctica. Moderate in terms of the design life of a suspension bridge. 40mph is a gale (just) if sustained so I suspect that was a gust. Certainly the film of the disiaster showing a man walking along the centre line of the bridge as it twists below him don’t look like a sustained gale (‘Twigs break off trees; generally impedes progress.’). Remote locations would be where “green” energy probably makes the most sense. But yeah, still requires backup fossil-fuel energy. No reason for it to be a FF backup. Any back up would do. In fact they have a back up since they had two wind turbines, they just decided, illogically to lock the second one, thereby probably increasing the wind load and increasing the likelihood of breaking that one as well. Unless the penguins were riding on the blades like a carny ride and created an unbalanced load? Greg, at least you are cynical about the empty-mindedness of the operators of this premedieval tech. After all, the same people made the decision to set a couple up there. Oh and two windmills in the same spot aren’t really back up. As an engineer, I’d venture the fair probability that these two weren’t particularly designed for Antarctic temperature and wind conditions – more likely a couple of spares from South Australia with high number SAE lubrication which becomes crazy glue at – 60C. The coefficient of expansion of the bolting holding the turbine to its base may have caused shrinkage sufficient for brittle tension failure of the bolts barring, of course, some idjit going off shift with the bolts not yet tightened. In the world of the Gang Green, we are unlikely to get a report on the failure. Greens don’t like engineers very much. Besides how hard can engineering be anyway. With the best will in the world mate, that sounds like assumption, piled on assumption, and discredits the engineers who probably designed and commissioned these turbines. It’s a failure, like any other, including planes, cars, nuclear power stations and my mobile phone. Understandable and not that dramatic in the scheme of things. Yes, Hot Scot, and all other failures in fossil fuels and nuclear get reported and vilified. Just being fair here. Really? Where do you see failures in diesel generators reported and vilified? Apparently they are old fashioned ones of fourteen years ago (used?) . And I am an engineer. Apparently nothing hit it. Apparently it wasn’t the wind. Apparently the turbine disconnected from its base some how and fell off. This is like an airplane ‘accident’ but as if the planes propeller fell off where it was parked! The meat of the story story is it fell apart for no reason. Not the usual flash and burn-up, or crumple in high winds. And yes, I have some concerns about the variation in quality of science and engineering these days. I run into more now than I used to – relying on black box models they may not fully understand. All machines fail at some point, and various laws of nature and machines pert near guarantees it will be at the most inopportune possible time. Plus…most machines have a duty cycle that requires being taken off line periodically for maintenance and repairs. At such a location, having a single back-up capable of handling all of the power requirements would seem like minimal protection against a very bad outcome. Gary Pearse. I agree with your input regarding the engineering aspect, but I would add that an administrator may have ordered these machines foregoing proper consultation, thus not understanding the special operating conditions required for the use of those machines in Antarctic conditions. Sorry mate but have you ever seen a diesel genset dissemble itself to the extent that this piece of bird murdering crap did? As if these were perpetual motion machines requiring no repair and parts and service. Hey, I’m planning on marketing perpetual motion machines soon—when my government grant comes through. There never was a better time. This is what happens when ideologues try to be engineers. They don’t mention that it is quite an old one, about 14 years I read some where. I dare say that the diesel generator is just as old. Certainly looks like rather an old design. Likely metal fatigue. Materials probably not designed for such cold conditions. Interesting to note the bend blade. Suggests that it is probably allow rather than fibre reinforced composites now used. BTW did you mean ‘alloy’ rather than ‘allow’? Old at 14 yrs? I bet it had not even produced enough “free” energy to pay for it’s purchase price in that time. Do you know how much diesel costs in Antarctica? If there’s one place where solar and wind can save some money it’s in the wilderness. I once did a solar project where the alternative was slinging in fuel with a helicopter. The project paid for itself in a single season just by saving helicopter trips. There was a conference item at one of the “pat ourselves on the back conferences” that estimated a zero discount payback of 5 to 12 years (depending on the cost of fuel) for these winders. No real specifics given, just a summary of the analysis. so can’t really be trusted. Of course, since it was a “pat ourselves on the back conference” they wouldn’t inject any bad spirit into it like saying “with a 7% rate the real world payback period is 23 years, as long as we continue to ignore maintenance”. I think they are over 20 years old. There appear to be two wind-turbines at Mawson. With luck, a big wind will bring the other one down soon too. hopefully enough clearance from buildings…! A good historical record of the ultimate demise of this modern reintroduction of a two millennium long adventure with windmills could be captured on time-lapse photography set up’s in wind farms around the world. This technology was understood by the ancients as intermittent in use for grinding grain, lifting water and the like. Water wheels were employed where continuous power was required for textile looms and the like. Today they have found for political purposes. I wonder how much fossil fuel will be burned from sending in the repair crew. Probably less than from flying in the diesel fuel. Too much ice for a ship? Except that now they have to do both… more diesel fuel and repair crew. …. or more probably only send in a clean up crew. Oh wait.. this is “green” agenda… no clean-up crew required. !! That must be about 500 tons of fuel per year. See what happens when you try to rely on unreliables. Whatever they do, they better get their plans together quickly. Slowly heading into that short period of ship access is available. You ship in replacement parts. Same thing you have to do if a diesel generator breaks. And you have to ship fuel for the diesel generator anyway. Less fuel than you’d have to ship if you didn’t have the turbines. It looks like everyone is in agreement that wind and solar intermittents are useful under some circumstances. Just not for base load in industrialised countries. This event provides one small cameo of why that is for those with the wit to understand rudimentary engineering. Let’s see….. 2 wind turbines for a part-time average population of 40. Anyone want to do the calculations for New York? How many wind turbines are needed.? It may not be so for a station right on the coast, but my recollection from a few years ago when a Antarctic staffer had to be airlifted out in midwinter, is that even airplane flights are impossible below a certain temp, this situation is also compounded by high winds and perpetual darkness being frequent for long stretches of Antarctic winter. Incredibly difficult and dangerous I should have said…but not strictly impossible. It’s currently spring, heading in to summer. Probably don’t have to fly in too many parts for the Caterpillar 3306 Diesel engine, since was one of the best ICE diesel’s ever made. I have had several of them. They probably have enough spare parts to get by for a few years, if they ever need them. Service regularly, change oil and will run for a very long time. Especially on a big fully loaded stationary generator. According to a link provided below, it seems that the main powerhouse has four cogenerators, three of which are running at any given time, and then they have an entire back up power house. It also seems they have more than one mechanic on the staff. Drunken Christmas brawls that put scientists in the hospital! Antarctica sounds like a rollicking fun place to spend some time. Yeah, but if you don’t use all that fuel, and actually use 30% less because of the turbines, you still reduce the amount of fuel you have to ship every year by 30% while still keeping your stockpile large enough to last the year. They have to send ships anyway. The turbines reduce fuel usage by 30%. Yay. They lasted for 14 years. Not bad under those conditions. One of them broke.. boo.. but so what? They’ll replace it, and get back to reducing fuel shipments by 30%. The only real potential negative you have identified is that it could have hit someone in the head. Yeah, well, so could a radio mast. I would assume that “don’t stand directly under the turbines while in operation” is one of the rules down there. Perhaps you can explain what negative consequences have come out of this? As far as I can tell the entire list of things caused by this failure are the need to ship a replacement, and an increase in fuel usage of 30% while they wait. Or, to put it another way. They aren’t reliant on “unreliables” as it was put. They just use them to reduce fuel shipments by 30%. Diesel fuel is flammable. Operation generates carbon monoxide. Many have died from these dangers. I am sure the dangers are kept under control at Mawson. And I’m sure they could find somewhere in Antarctica that is not so crowded that space could be reserved for safe operation. The flash point for diesel fuel is normally above 125F. The flash point for a flammable liquid is below 100F. Therefore diesel is non flammable. The flash point is the temperature that a pool of diesel will ignite when holding a flame above it. Yes, an intriguing apparent contradiction. I had hoped that your research skills would elucidate! A lot depends on the delivered price of diesel. It if was the cold season and I was there, I’d want two options for power instead of one. The above isn’t answering the same question, but the outline is similar. If the price of diesel is a concern the Aussies should not have a station on Antarctica anyway. Doesnt friggn matter. The green jobs created in the process are worth it. Green jobs…. Does the piloting of the plane that brings in the repair crew count as a green job? Do the guys fueling the plane count as green jobs? Wind conditions were 40 knots. “30-metre Enercon E30 turbine”, boom, pow. I watched the video in suspense as I saw a bird fly towards it. Looks more like an E40 to me. You would think that a Enercon E30 turbine would stay bolted together and something else fail. Maybe some junior tech guy never re-torqued the mounting bolts? Or perhaps they have started outsourcing their material supply chain to China from Germany. That would really explain it. This is an older turbine and has been operating for over 10 years. If the mounting bolts had been under torqued, it would have failed long ago. And the current supply chain was not how the turbine was supplied, so it’s unrelated to any supposed Chinese sourcing. What piece of equipment doesn’t fail in these conditions. But all of a sudden it’s the focus of attention for the knockers of the tens of thousands of wind turbines across the planet. You guys are sounding like the alarmists now, get a grip. I don’t like them any more that the rest of you, but this is not symptomatic of every wind turbine, it’s an isolated case. Antarctica is famed for its winds. It is a serious design fail for a wind turbine meant to operate there to fall apart in a mere 40 knot gale, or maybe a gust from a weaker blast. Somebody will ask for a link for this but I don’t have it. Back in the early days of “Gone with the Wind” I read a story about a city in Minnesota (or maybe Wisconsin) that “Went Green” and installed a bunch of them. When winter hit, they failed. Seems they were produced by a California company and the lubricants became glue in freezing weather. Might have been the fault of whoever wrote the specs for the project. I don’t remember that the story ever said. I also remember reading somewhere that in Siberia, vodka is sometimes added to the hydraulic fluid of the machinery to keep them running. Wind your neck in mate. It’s a serious design fault that you’re going to fail sometime in the not to distant future. It’s a fact of life that mechanicals fail, more frequently in frozen wastelands. Perhaps it’s more pertinent to point out to the green brigade that this is an example of life in a cold world, rather then flagellate the poor turbine and it’s manufacturers for dropping dead with frozen bollox. Like I said, you’re all sounding like the green brigade making a mountain out of a molehill. Anti waxing agents are added to modern day diesel fuel to stop it freezing in the exposed pipes of modern vehicles. That’s only been common in the last 30 years or so. Before that, people used to light fires under trucks to thaw out the fuel lines. I suspect the Russians got the same idea around the same time as us, and rather than wasting good Vodka, added the same anti waxing agent so they could drink the vodka and not waste it. And you do recall, they were the first country to put a man into space. Whatever you get from the media, this is not a backwater. Russia is a seriously technological country. Strictly speaking…not exactly all of us. yeah HotScot catastrophic collapse is just the norm isnt it? we should just move on. Many of the hundreds of wind turbines around me (Lat 46 N) have lasted longer than that. Maybe doesn’t get as cold here for as long, but 35 below zero F is possible, as is 115 above (more common). One did however collapse in November 2013 on the Washington side of the Stateline Wind Project, which includes 456 turbines. There are other projects in my area as well, and even more farther downstream on the Columbia. Ya I kno! Fun thread though. Turbine down highlights pompous, ignorant greenie arrogance and is a general signal for beer and hilarity at the doomsayer’s expense. Severed heads rolling on the ground? Looks like the work of dastardly Daesh to me. Have they claimed it yet? Those ISIS folks could have shown their sense of humor by taking credit for it (in the right way). They are lacking a good western PR guy. Are they’re taking applications? Well exactly. But at that site those are the only possible conditions for a wind turbine. Diesels can sit warm snug and out of the weather in a machine room. The vulnerability of wind turbines and their inaccessibility for maintenance makes them a poor choice for anywhere. Blade icing, bird strikes, insect build up – these all unbalance the rotor and can lead to catastrophic failure. Failure of the feathering mechanism can lead to over speed. Salt spray around the bearings in the presence of massive magnetic fields from the generator itself lead to electrochemical corrosion. Of necessity the blades must pass from smooth wind to lower speed boundary layer wind, and this puts stress on the blades and bearings, as does any boundary layer turbulence. In short of all the ways to make electricity there are, a wind turbine is about as hopeless and unreliable as it gets. You cant polish a türd…unless its been dead for a million years…and has turned into a coprolite. Mirthful laughter at mental image of warmistas busily attempting said polishing, with knitted brow and making exclamations of confused puzzlement. He was thankful nobody was injured? I didn’t know that was even possible with renewable energy. Only direct injuries count with the Greens. And birds and bats being batted out of sky don’t count. Neither do people living in cities when the power from renewables just isn’t there to heat their homes or the price of electricity has skyrocketed due to the war on non-renewables. No. Such injuries and deaths are hidden/adjusted/deflected/ignored or twisted into being the fault of Fossil Fueled Climate Change. There are (so i am repeatedly told) fantastic climate models that predict & reproduce weather with spectacular accuracy for hundreds and thousands of years. Surely developing a wind turbine model is then child’s play and they can rerun the climate of the day and Voila we should know exactly what happened. Models to the rescue. (and no need to go mucking about with all those annoying ice cores and tree rings either). Well, I suppose, while it lasted, at least the thing kept the generators battery charged…. We were told via the media a few days ago, that the australian ice breaker was leaving for is first trip to Antarctica, ended up anchored just a short distance down the coast, due to bad weather. Gee, I was hoping the video would show them crash and burn. The Mawson Station uses a combination of diesel and wind turbine for heat and electrical needs. Oh and…, aren’t they shutting the other one down for safety reasons? Thanks for the info! The wind mills were installed in the year 2002-2003. For talking purposes, lets say they were operational in November 2003. Failure occurred in Nov 2017, demonstrating an operational life of 14 years. This seems to be a ‘short time’ to failure! 29% of 650,000 L of diesel is 188500 L. At a dollar (US or Au) per L that is $188,500 a year savings. If we knew just how much the 2 wind generators cost to purchase, ship to the site, and install [engineering and labor] we could find out how long to would take to break even on the investment. I read wind turbines cost about $3,000 to $5,000 per kW depending on size. Assuming $5,000 x 300 is $1.5 million each x 2 is $3 million. $3 million / $188,500 = 15.9 years. 16 year return on investment assuming no maintenance costs. So I would estimate 20 years, back of envelope. In my opinion this is probably a good place to try and use wind turbines because of the high cost of transporting diesel. The only caveat is whether the 29% fuel savings is real because the diesel generators are always on anyway. If it is a simple matter to add one more diesel generator and increase fuel consumption by 10% to meet all electrical demands then having two separate forms of energy generation would not make sense. So, the electric snowcat is going to be charged by the diesel generator? Wind turbine for electricity at a remote station is the perfect application of wind turbines. Actually, if there are any places turbines are useful, Antarctica is probably among the list. There’s a lot of wind and the only other option is diesel, which has to be brought in. That being said, that would be one of the very short list of places turbines are useful—where there is no real electricity. That is really the crux of the argument – the proponents insist that the wind/solar systems can replace all other electrical sources. They are clearly wrong. It would help if people promoting wind energy would put the information out there for the rest of us to see. How “useful” is wind turbine energy in Antarctica? The links to this information appear to have long been broken. As long as you have power backup. Otherwise you are simply taking your life in your hands. Of course you need backup. And the turbines are only useful if they reduce the diesel consumption. Only if you need electricity to survive. A billion people live with no electricity at all. That it failed after 14 years says nothing about the application. That part of Antarctica is infamous for almost constant strong catabatic winds (very odd they don’t get more than 34% out of the turbines). In combination with the extreme cold I’m not surprised that the turbine failed. It’s difficult to get lubrication to work properly in extreme cold. The problem is the winds get close to 100 mph for a lot of the time. So the wind generators spend most of their time feathered and shut down. I’ve had that same though, kinda like having a transmission with multiple gears. Novel Idea. They probably only get 34% because it is excessively windy there, and the blades are full on brake between gusts. Still, 34% is probably a better capacity factor than most other land based wind mills. Too bad someone couldn’t engineer some form of brake controller that would allow it to keep spinning/generating at a normal RPM through high winds and gusts without self destruction. That has been a problem at some very windy sites like Pincher Creek in Alberta where the wind is just too fast as those chinook winds descend out of the Rocky Mts. Have driven by in a good strong steady wind and they were all braked. Another thing to fix with Big Wind and make them more efficient, if they are going to be used. Maybe the new ones they put up will be better than the older generation of windmills. Some sort of a friction brake that captured and utilized the heat that resulted from all that friction? But that may not reduced the aerodynamic stress on the turbine blades. I once worked for the British Antarctic Survey, and was due to over-winter ‘down south’. I got the job because I was used to being at sea, was a scientist of the right sort, and practical (DIY mechanic, lab chemist etc). is a concept that I still apply in my work & life in general. Looking at the picture, my concern is that the substantial debris you see lying on the ground could have landed on the pipes and cables to the left, or the containers behind the tower. What numpty placed this collection of equipment like that? Perhaps the ideology was more important than the safety & reliability? Yes, what’s in the pipes and cables? Heat and power from the real power station? They may have dodged a bullet there. Someone ask Griffy if that turbine survived for it’s entire 25+ year “design cycle”. Wouldn’t coal require a power plant to be useful for electricity? They might be able to use it for heat, but coal is a very dirty fuel for that use. We tried it years ago. After 14 years, maybe it finalled pivoted CCW enough times to unscrew itself from the pole? Saw this bit of news on Jo Nova’s yesterday. Got me curious. While searching for electricity generation information at Mawson, I came across references to the power generating history at Mawson; only the links were broken. The engine room of the main power house. Rows of large diesel engines. The main power house on Macquarie Island. 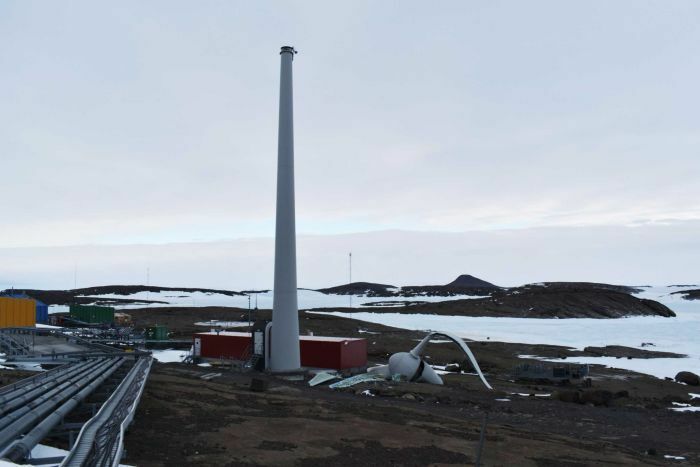 The Mawson power supply is also boosted with wind powered turbines which can supply up to 95% of the station’s power requirements in times of high winds. In the MPH, the generator sets produce both electricity and heat. The waste heat generated by the engine cooling system is captured and used to heat the stations. This process is known as cogeneration. The use of waste heat in this way results in a saving of up to 50% of the station power requirements. The cogeneration system normally provides most of the station heating requirements during the summer months, and a substantial amount during the winter months. Diesel generating waste heat is used to heat the stations. consider, if this waste heat pump is shut down in favor of wind generated electric heat; when the wind shuts down, or a turbine crashes? That would require restarting the diesel generators and some time to pass before sufficient waste heat is available. Much like automobile heaters dependent upon waste engine heat for the passengers, it takes time. The broken link to a electricity generation chart is apparently broken on purpose. Even http://www.antarctica.gov.au links for that chart end up at the wind turbine press page. Without the actual operating chart available, proponents can claim any waffle word fantasy without worrying that the truth would suddenly expose them. Quick examples are seen where various Mawson wind turbine pages use capacity figures to claim energy production levels. Perhaps those diesel generators work much more frequently and consistently to ensure quality frequency, voltage and amperage for critical equipment. The diesel generators are always on. The wind turbines provide an average of 34% of the electricity needs. They do not provide the heat needs. And sometimes they provide nothing. One of the very few times and places “renewables” makes perfect sense and they use the wrong oil. Sheese. Producing a machine that operates effectively at a temperature of say -50ºC needs detailed knowledge as to how materials operate at such temperatures: not just lubricants but also structural materials. “Off-the-shelf” won’t cut it. There is a town in northern Minnesota named Grygla. That’s the only sound your car makes when you try to start it at -40F (=-40C). Say it softly and briefly, and once. Well, it did last 14 years, which included 14 winters, which are far harsher than when this one failed. So I doubt it was a misapplication of machinery, per se. I wonder how they keep the wind turbines from of ice build-up? Darn wrong word. My mind said it, fingers didn’t. ! I wonder how they keep the wind turbines free of ice build-up? Not a problem at those temperatures. Icing is mostly caused by supercooled droplets. Extremely dry air in East Antarctica. Might be a problem up on the Antarctic Peninsula though. Here is the link to Mawson’s webcam video. Though at only two days, it is fast approaching past turbine failure time. http://www.antarctica.gov.au/webcams/mawson Halfway down the page. NB, The article above makes a claim about measuring Mawson wind speeds at around 40 knots; “they were up to about 40 knots”. Well, maybe at maximum gust. [Senator Collins:] It’s a great pleasure, thank you. [Senator Collins:] Yeah, the one the blade fell off? [Senator Collins:] Well, there are a lot of these wind turbines around the world all the time, and very seldom does anything like this happen … I just don’t want people thinking that wind turbines aren’t safe. [Interviewer:] Was this wind turbine safe? [Senator Collins:] Yeah,,, the ones the blade doesn’t fall off. [Interviewer:] Well, if this wasn’t safe, why was it installed? [Senator Collins:] Well, some of them are built so the blade doesn’t fall off at all. [Interviewer:] Wasn’t this built so the blade wouldn’t fall off? [Senator Collins:] Well, ‘cause the blade fell off. It’s a bit of a give-away. I would just like to make the point that that is not normal. [Interviewer:] Well, what sort of standards are these wind turbines built to? [Senator Collins:] Well the blade’s not supposed to fall off, for a start. [Interviewer:] What’s the minimum maintenance? [Senator Collins:] Oh,… once, I suppose. [Senator Collins:] Ludicrous, absolutely ludicrous. These are very, very strong wind turbines. [Senator Collins:] Well, the blade fell off in this case by all means, but that’s very unusual. [Interviewer:] But Senator Collins, why did the blade fall off? [Senator Collins:] Well, the wind blew. [Senator Collins:] Tge wind blew on the turbine. [Senator Collins:] Oh, yeah… In Antarctica? …Chance in a million. I didn’t see any of the Monty Python people in the credits … whats up with that? There are a lot of the really big windmills close to freeways and even at the Budweiser plant off I-80. How will the greenies react when one of these self destructs and slices through a few cars, along with their occupants. Will they call it a sacrifice for the greater good? I don’t think the turbines are close enough to I-80 for that to happen. There are some close to the roads in Wyoming, too. When turbines come apart, from the pictures I’ve seen, mostly they fall more or less straight down (the one near I80 at Arlington did fall over, but was not near enough to the highway to be a problem). Gravity works. I can’t see how the turbine itself could fly very far. Ice throw might hit the highway, but even then, it’s unlikely. If you’re out hunting under turbines, picnicing under them or strolling along a walkway under them (that “multiuse” thing, you know), there’s a higher chance. Cows and wildlife underneath could be in serious trouble. I think the nacelles on those are exceedingly heavy. Must have been all the penguins dancing at the resonant frequency of the turbine.. Also a known cause of iceberg cleaving.. Dangerous place the Antarctic when the penguins dance.. The windmills look quite close together so maybe there really was some resonance. Famous case in UK of cooling tower collapse at Ferrybridge (those ones that are always belching evil black carbon!). Mawson and the others are a massive waste to tell us the ice is thickening! How will ‘fact finding’ in the Antarctic help pay down Australia’s trillion dollar State and Federal debt?. Huge salaries with over-generous benefits and superannuation. Contractor fraud and overcharging are rampant. Massive CO2 emissions from helicopters, snowmobiles, generators and vessels etc. A Government department (the AAD) dedicated to paper shuffling and shovelling money at anything that seems remotely like a good idea regardless of the merit. The waste and duplication of work already done by other countries is on a scale of unimaginable squandering. People must rise-up and stop these criminal scientific enterprises that keep worthless academics in clover. Their productivity is that near zero it’s unmeasurable. Indeed…one might wonder why there are a whole slew of research stations in Antarctica, manned all winter log when it is pitch dark and too cold to go outside. I mean, exactly what are they doing down there all Winter? Or the rest of the time, for that matter? Well, as reported, they are drinking, carousing and fighting. With research scientists from all over the world, it must be WW3 down there. But nobody dead yet, so they must be sorting it all out. Elon Musk and NASA should be taking notes, since this may be like a one way trip to Mars. Chopping down trees, I’m told. You mean like a LumberJack !!!!!! Maybe someone mistook the turbine for a tree while in a drunken stupor ? Maintaining a presence, so as to uphold national claims to territory. The Argies went so far as to fly in a pregnant woman so that they could claim the only native Antarctican. It’s called metal fatigue followed by fracture (likely no plastic deformation in between). Can anyone imagine the cost to repair? The properties of most metals change at extremely low temperatures (strength, toughness, brittleness and durability). Most metals increase in brittleness. Selecting metals for service at extremely low temperatures is important with respect to composition as well as fabrication technique. Preventive maintenance including checking fasteners and frames exposed to extreme cold and shock is critical. None of this would have been undertaken at the exterior top of the turbine as it would be impossible to do for many reasons in such a climate. Installing a wind turbine in Antarctica is pure insanity and only something the ADD would do without much thought for the consequences. I’d say IRREPARABLE. No part of the tower can now be guaranteed to be tenable. Most likely will have to be completely removed, (maybe) and replaced with a new one. That means new from the very bottom of the foundations !! Leave the old foundation where it is, most probably, like most “environmental” cases. Sorry AAD Australian Antarctic Division (not ADD); but yes many there suffer from attention deficit disorder when considering money conservation. No reasonable plan… No plan to reasonably isolate non-renewable, gray energy converters from the environment. Wild guess: failure in the feathering mechanism, allowing one vane to wobble a millimeter or two. Metal becomes brittle when exposed to extreme cold, in this case for 14 years. Plus, you mentioned it, thermal expansion and contraction. Unfit for purpose under these circumstances. Very likely. But (1) it depends on the alloy; (2) if it’s embrittlement, the metal has been like this since the turbine was installed and it has functioned fine for 14 years. Something must have changed. That’s what must be determined. The ultimate irony would have been if the windmill fell on the diesel house and put it out of operation, I’m not sure what the red shipping container is but if it’s anything to do with the diesel power plant or power distribution I’d get it moved to a safer distance from the windmill. In autumn leaves are falling of trees. Simpels. It’s spring down there. Fortunately, since they can ship in more diesel as needed. Plus some more Diesel generators. I hope they’ll remove the windy debris before a peng gets hurt. diesel generator are especially great in Antartica, because there, heat is not wasted, it is needed as much as electricity. So they basically have 100% efficiency for the fuel. That makes wind turbine all the more stupid. No, cogen is not magic. They might get 90% efficiency, tops. However, I cannot see any actual figures for cost of fuel saved or cost of installing the wind turbines and associated energy storage. They are both expensive, given the transportation costs, and I would love some hard data. 1. What did the project actually cost, we all know how inaccurate “modeled” can be. 2. How do the numbers work for a 14 year life? Putting the wind turbines close to other things was clearly a mistake, if it had landed on a person or some important equipment they would really have a problem. says that “The pair of turbines had been in operation since 2003 and usually provided about half of the station’s power each year.”. Since they certainly use fuel for vehicle, heating, etc., the equation “29% fuel saving = half the power” makes sense. That would be ~200.000 liters, worth ~$100.000. Whatever model they use, only a fool invest “between $2 million and $3 million” to save “between $1 million and $4 million over a 20-year project life”, that is, between $50,000 and $200,000 a year, in a risky business in harsh environment. The project just pay for 5% financial cost, IF everything works OK, which was pretty improbable, as evidenced. That’s a NO-NO for any banker. We can safely estimate that ~1 or 2$Million went down the drain. In Antarctica, you need proven stuff easy to maintain, repair, and replace if need be; you need diesel generator that don’t even have to stand the weather because they are kept in-door, not exposed wind turbine impossible to replace if they fail. I MAY trust russian device proven in Siberia or at their Vostok station (where, guess what, they DON’T have wind turbine, despite steady wind…. ), but western econut-backed stuff was a gadget from the start. well, for sure they didn’t the wind turbine. Dear Forrest, I beseech you, do not give ‘them’ ideas. I have visions of the moon covered with giant turbines like these. let me give you a new hypothesis: a climate change denier, frequent writer at WUWT sabotaged the turbine. Unlikely, as that would require a very expensive ticket to get down there, and the Big Oil Climate Denying Conspiracy Cheques don’t even cover the in-flight peanuts. Are there any coal deposits in Antarctica? I like the idea of a coal fired electrical plant there, far away from the northern hemisphere. Is it really any worse than diesel fuel with today’s clean air technologies? We could turn the whole continent into one big power plant, and power the whole world! There cannot be that many endangered species in Antarctica, like the flying penguins. Of course, the damn thing rarely works, certainly hasn’t made any money, and for added good measure, has been offline for months, pending an “upgrade”, while being shut down for “routine” maintenance. I’d give odds that the thing never turns again. Realists in Newcastle (NSW Australia) had a bit of a laugh when they removed Newcastle’s only wind turbine..
Is that true? Been a while since I was there. I have not heard a thing about that and I live in Sydney. Perhaps a group of a half-dozen small, non-elevated, vertical-shaft wind turbines would have been a better choice down there. IIRC, some versions of them are simpler, lighter, cheaper, easier to install (no need to fasten to bedrock), automatically resistant to too-high wind speeds, and easier to maintain and repair. They wouldn’t be as efficient as what just fell down, but they would be efficient enough in a location where there is normally constant wind at ground level. Antarctica is a good location for supplemental wind power—of the proper sort. If they (vertical shaft winders) didn’t fall over (or off) then, all in all, they would likely be more efficient than the ones that do fall down. Lubrication is a problem at very low temperatures. If it was calm and very cold for a period, and then very windy, in a place like Antarctica, I believe any lubrication system could be compromised. If this was the case, the turbine could be suddenly activated effectively with no lubrication and all the bearings would overheat and then in a short time seize. The resulting de-acceleration of the blades and turbine could simply rip everything from its bearers. Yup I have a little experience as a mechanic in Canadian winters. Thank goodness they didn’t blow up the generator room after they went green and installed the turbines, the staff might have been preserved frozen until next year! Unlike South Australia , which blew up its coal fired power station and then had the mother of all outages after a storm that blew down the power lines. It’s a shame, the turbine might have made sense in that environment, if they hadn’t bought some cheapo fan from som corp milking the subsidies while there still hot. Speaking of hot, someone get those guys a small reactor to power their needs without polluting the area with spilled diesel, fumes, and rotor scraps.